Tarotina is a mother of 2 who resides in Pennsylvania. She's been an active KOLer since 2005 and can be found in /games and lurking in /clan. She's pretty much always on, and quite easy to get along with. If you see her around, feel free to say hi. 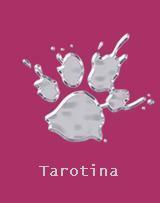 Tarotina hosts "In The Cards" on GKOL. Tarotina listens to just about everything, and loves to introduce people to new music and bands, but she's also a big fan of older music. Her show consists of a lot of alternative/rock, with some dance and other things thrown in the mix. Games will vary from Majority Rules to Trivia, and occasionally she'll hold ARs for her listeners. (This is not only a good way to increase her listeners, but to find mall bots). All requests can be sent to Tarotina via PM or KMail in game. If it's something she doesn't have, or you're pretty sure she won't have, feel free to email them to her, in an MP3 format, to Tarotina1979@gmail.com. Please send a PM letting her know you sent her something, otherwise it'll be forgotten until the next time she checks her mail. Also, feel free to make dedications when you make requests. Any donations are appreciated for hosting games, and can be sent directly to her. If you'd prefer her to run a certain game with your donation, please let her know and she will.